No reviews for two years! Not much has changed. No O�Hanlons beer anymore, but two unusual and well kept ales. Nice service. Looks like the Dim Sum has stopped as you can bring your own food in. Was busy last night as I think the novelty of the ping pong table(!) at the back is a popular draw for office workers to let off a bit of steam. I like it here, would've also liked to have seen it when it was a proper pubby pub called O�Hanlons. O�Hanlons Yellow Hammer and Port Stout as the only 2 draughts both were excellent however. Several draft lagers including Freedom Ale which was great too. Superb range of bottled beers from all over the world plus an interesting looking Dim Sum. Can understand the comment below that it�s not very pub like, it was however spotlessly clean, comfortable and very friendly- would definitely return. An unusual spot, long and narrow, yet with two clearly defined areas, the front section with the bar and a more secluded strip at the back. The interior is modern and has a mix of what I can only describe as Oriental/African decor and furniture, especially the seating and tables which vary in design. Dim Sum is a speciality it appears. The general theme was reinforced by a low volume, chilled world music soundtrack. A distance from my idea of a traditional pub, but I still liked it, four pumps but only two in use on my visit, O'Hanlons Port Stout and Sambrook's Wandle. Tried the Wandle and it was in good nick. I didn't sample the dim sum, but some bloke did call in for a takeaway while I was in. Doesn't look much like a pub from the outside, which is probably the reason why there were only 2 other customers except for ourselves. The interior has a modern feel and it serves a kind of oriental tapas for diners. 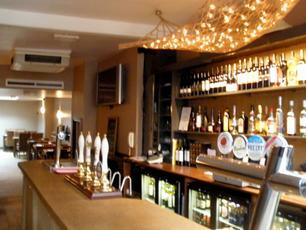 There are two real ales available - O'Hanlons Goldblade and Sambrook's Wandle during our visit yesterday. They also sell Luscombe Organic cider. We sat at the rear on some wicker like seats underneath a skylight. No longer a traditional pub. But a fairly pleasant experience nonetheless.